Joining wood with wooden fasteners has several advantages. You can avoid problems such as wood rot, metal corrosion and rust, and dangerous "nail pops" or "shiners". It can also help you avoid splitting the grain, and provide a more beautiful finished product. 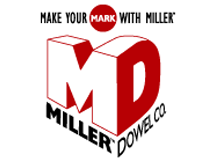 Miller Dowel Company in Chicago, Illinois, is proud to offer the most recent advances in wood joinery through our unique stepped dowels. Peg construction traditionally involves the difficult task of driving a pin dowel into a pilot hole that is just as tight at the top as it is at the bottom. Not only do you have to use a hammer from the very beginning, but it only gets tougher the deeper you go. The Miller Dowel is inserted 75% by hand because of the relationship of the dowel shape to its pilot hole. You get better holding strength, and it is easier to tap in! Another advantage of having the dowel inserted so far through the top board is that the pilot hole does not have a chance to misalign. The hole for a traditional dowel must be perfectly matched up so the dowel can enter the second piece of wood without problems. The Miller Dowel is already well into the second piece of wood before you even reach for your hammer! The Miller Dowel has exceptional holding strength because the shoulder between the widest and second widest sections gets lodged in the top board. This produces a capping effect like the head on a screw or a nail. Our dowel has excellent adhesion as glue remains all along the Miller Dowel's length, settling under each shoulder, instead of being forced down to the bottom of the hole or sheared off at the top. Many woodworkers appreciate the decorative appearance of the pegged or "Shaker" look. Since our dowels can be stained prior to insertion, it's simple to enhance the contrast for both light and dark woods. Why use plugs to cover countersunk screws? Using plugs involves drilling a pilot hole, screwing in a fastener, and then gluing and inserting the plug. Why not just skip a step by using a Miller Dowel? Plus, you won't worry about the plugs falling out and disappearing. Our fit remains tight. Unlike nails or screws, wooden dowels are naturally flexible and dampen vibration. There is no compression of the surrounding wood, which would loosen the fit. The original intent for our product was to be a safety fastener. 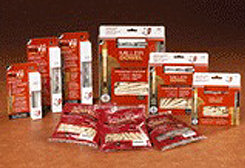 Injuries and damages caused by exposed nail/screw heads are prevented by using Miller Dowels. Miller Dowels introduce a new joinery technique that can be used instead of difficult, expensive, and/or very time consuming methods like blind dowels, biscuits, pocket screws, or mortise and tenon. 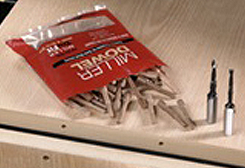 There is one time-saving assembly technique that is made possible by Miller Dowels. 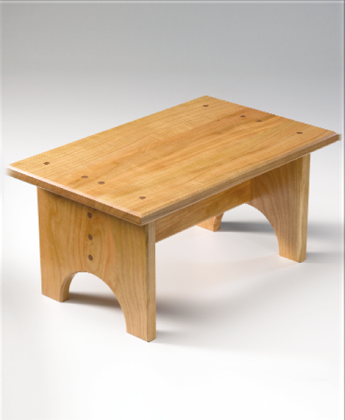 A Chicago woodworker developed this as an alternative to the mortise and tenon joinery in his furniture design.